Right now, doctors can’t tell whether women with DCIS will go on to develop breast cancer. The PRECISION team want to change this, and stop women getting treatment they won’t benefit from. Ductal carcinoma in situ (DCIS) is a condition that can sometimes develop into breast cancer. Over 51,000 women are diagnosed with DCIS each year in the USA over 7,000 in the UK and over 2,300 in the Netherlands. But right now, doctors can’t tell whether women with DCIS will go on to develop breast cancer. 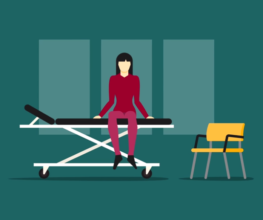 This means that, unfortunately, some women with DCIS undergo hospital visits, surgery and even chemotherapy and radiotherapy that they don’t need, while also causing them unnecessary stress and anxiety. The PRECISION team want to change this, and stop women getting treatment they won’t benefit from. How do we achieve our aim? The PRECISION team will study tissue samples taken from women with DCIS during surgery. These samples will come from women living in the UK, US and the Netherlands. These samples will be looked at in great detail, studying their characteristics, including their genetic make-up and what kind of immune cells they contain. Alongside this, they will gather clinical information about these women, recording whether their DCIS came back, if they later developed breast cancer, and if so, whether it spread. 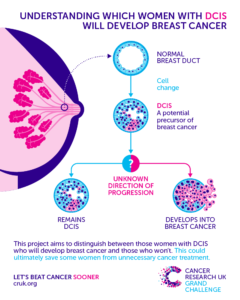 All this information is used and mathematical modelling is performed to search for clues (biomarkers) in the DNA of women who have had DCIS, that could indicate how likely they are to develop breast cancer later on. Once potential biomarkers are identified, they will be tested in larger clinical trials for women with DCIS. The goal is to find out whether these biomarkers can accurately and reliably distinguish between women with DCIS who will likely develop breast cancer and should be treated, and those who can safely avoid treatment. By identifying biomarkers that can distinguish DCIS patients with a low risk of developing cancer from patients with a high risk, this project has the potential to reduce over-treatment of DCIS patients. Ultimately, the PRECISION team hopes to spare thousands of women unnecessary treatment while making sure those who need it, get it. The Netherlands Cancer Institute (NKI) is leading the project. Co-investigators are: Wellcome Trust Sanger Institute, University of Texas MD Anderson Cancer Center, Duke University, University of Birmingham, University of Texas. There are several patient advocates involved as collaborators: Independent Cancer Patient’s voices (UK), Borstkanker Vereniging Nederland (NL), Patient Advocates in Research (USA), and 12 other collaborators.